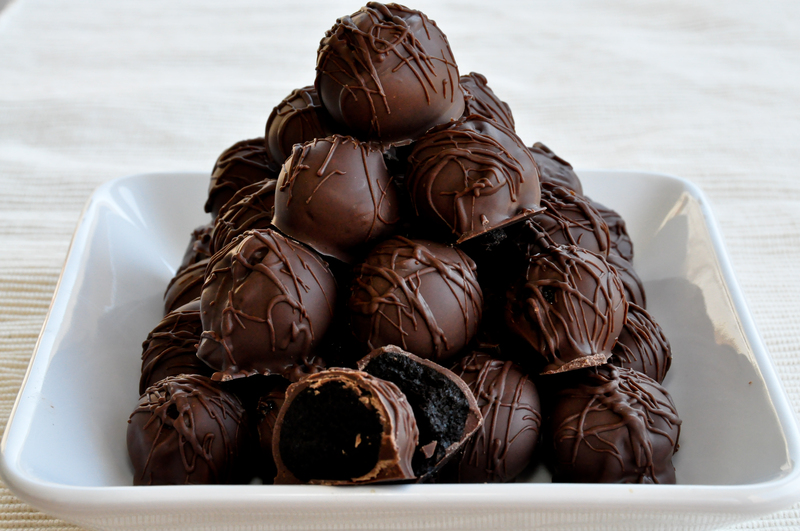 Oreo Balls – Mama, Can I Lick the Spoon? Christmas at my parents’ house doesn’t involve a sit-down dinner. Instead, we make – and eat! – finger foods. Lots and lots of yummy hors d’oeuvres and nibbles. And this isn’t some dainty, delicate food experience. No, this is a fill-up-a-big-Chinette-platter affair. My brother makes barbecue meatballs and these fabulous wienies wrapped in bacon and cooked in brown sugar. My sister-in-law makes queso and lots of cookies. My mama makes several varieties of cake balls and peanut butter balls and chicken salad sandwiches. I make tomato sandwiches, sausage balls, Oreo balls, hot bacon dip, firecrackers, pralines, corn dip, crock pot candy, turtle cheesecake fudge, bacon cheddar deviled eggs, cranberry jalapeño jelly over cream cheese, and boudin-stuffed mushrooms. Stay tuned and I’ll be posting most of those recipes in the next few weeks! I love it when a recipe is just as easy as it is delicious. This one definitely falls into that category. Place Oreos and cream cheese in a food processor and process until a ball forms. Use your hands to form balls the size of large marbles and place them on a wax-paper-lined baking sheet. When you have made balls of all of the mixture, place the balls into the freezer to firm up for about two hours. Melt the chocolate in the microwave or over a double boiler. Use a fork to dip the Oreo balls completely in chocolate and place each one onto wax paper. Allow to cool until chocolate is solid. Well Duh #1: While the chocolate is still melted, you may sprinkle chopped pecans onto the balls. Well Duh #2: You may drizzle each ball with melted white chocolate or even dip them in white chocolate, if you like.